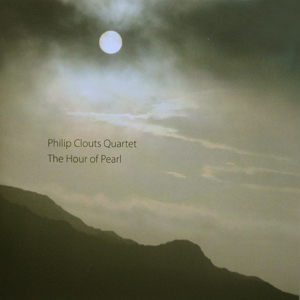 AS THE BEAUTIFUL, atmospheric album art of Philip Clouts Quartet’s new release implies, the music of ‘The Hour of Pearl’ references nature and the passing of time, taking John Steinbeck’s writings as inspiration – the ‘hour’ being “the interval between day and night when time stops and examines itself”. Following in the footsteps of pianist Clouts’ previous ‘Sennen Cove’ collection, which drew on the experiences of his own West Dorset home location, these eight original compositions have a joyful accessibility to them. But, perhaps not unlike searching for the treasures of that same Jurassic coastline, deeper investigation reaps rewards – in this case, heartwarming sounds from his high-ranking quartet team… Carlos Lopez-Real (alto and soprano saxes), Alex Keen (bass) and Jon Desbruslais (drums). Philip Clouts is immersed in jazz and world music, especially of his native South Africa, inspired by his father’s deep love of township jazz as well as such luminaries as pianists Abdullah Ibrahim and Chris McGregor – and that spirit lives through ‘The Hour of Pearl’. So, to the album – and the unrelenting, piano-suggested waves of opening track, ‘Riptide’, immediately creating a vivid coastal impression, Desbruslais’ crashing and shimmering cymbals adding greatly to the imagery. Lopez-Real introduces a bright alto solo tune and subsequent improvisation before Clouts takes it off in other directions, bass and drums adding sparkle to the shared melodies. ‘On West Hill’ is one of the album’s homely, amiable numbers which suggests the familiarity of an old jazz favourite, the fluidity of Alex Keen’s bass solo a pleasure to hear. The positivity continues with the upbeat ‘Delta’ which, halfway through, suddenly changes up a gear, clearly to the delight of Lopez-Real who creatively runs with it. And never let it be said that drum solos are always long and tedious – Desbruslais times his impressively varied, Cuban-inflected percussive display here to perfection. The jaunty, sunny ‘Flamingo-ing’ is irresistible as it skips happily along, Clouts obviously revelling in a playful mood which demonstrates, in block chords and octaves, the influences of his South African background, as well as a beautifully lyrical sax-led interlude. Title track ‘The Hour of Pearl’ paints ‘the interval between day and night’ in a more contemplative hue, characterised by a piano/bass unison riff interspersed with smooth alto lines. Triple time ‘Clef Mona’ dances alluringly and mysteriously, Lopez-Real’s soprano soaring above Clouts and his rhythm section who increasingly push the pace (coastline impressionism never far off). With its delightful, held-back bossa feel, ‘As Evening Falls’ continues the theme of passing time, Lopez-Real’s low sax and Clouts’ luscious, sparing, major/minor accompaniment so sensitively felt; and Keen’s simple yet effective bass further enhances, to my mind, this portrayal of the peace of a Mediterranean afterglow. The gentle, skittering, rattling percussion and repeated piano motif of closing number ‘Nyasa Lullaby’ (a reinvention of a 2004 piece) again display African overtones, soprano improvising both fluidly and contentedly. Philip Clouts’ jazz belongs to that long line of successful musicians who, rather than hammering at the outer limits of the avant-garde or free jazz world, create emotionally-felt, highly listenable melodies and improvisations which colourfully lift the spirits. A rather pleasing soundtrack to this late Summer transition into the ‘season of mists and mellow fruitfulness’.